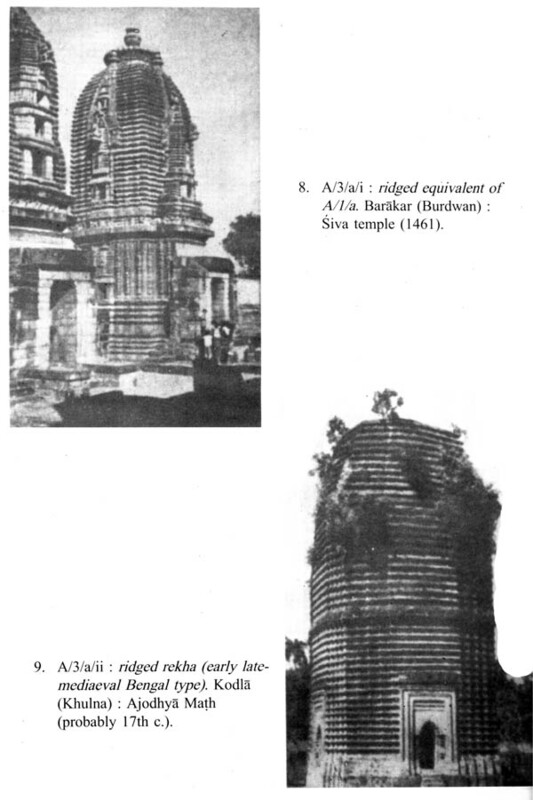 BENGAL is a land of temples, the extant ones belonging mostly to the late medieval period. These monuments came in for a detailed and systematic study by David J. Mccutchion, who devoted himself to the task with almost a missionary zeal. At the invitation of the Society he delivered and illustrated lecture on 20th May, 1970 before our members who evinced keen interest on the subject. The present monograph is the outcome of that lecture. 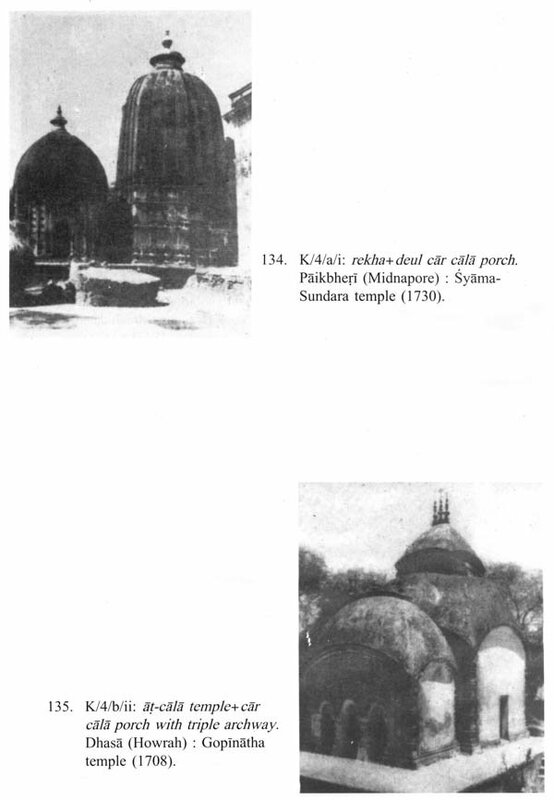 Though the manuscript was made available to the Society as early as April, 1971 the matter could not be taken up due to David's absence from India till September 1971. However even when the entire text was composed and made over to the author by 20th December, 1971 for scrutiny, the cold hand of death unfortunately snatched him away from our midst on 12th January, 1972. Naturally the work was held up till the proofs, two forms of which could have been corrected by the author himself, were recovered from the custody of the British Council in Calcutta, who had taken charge of all his belongings on his sad and sudden demise. 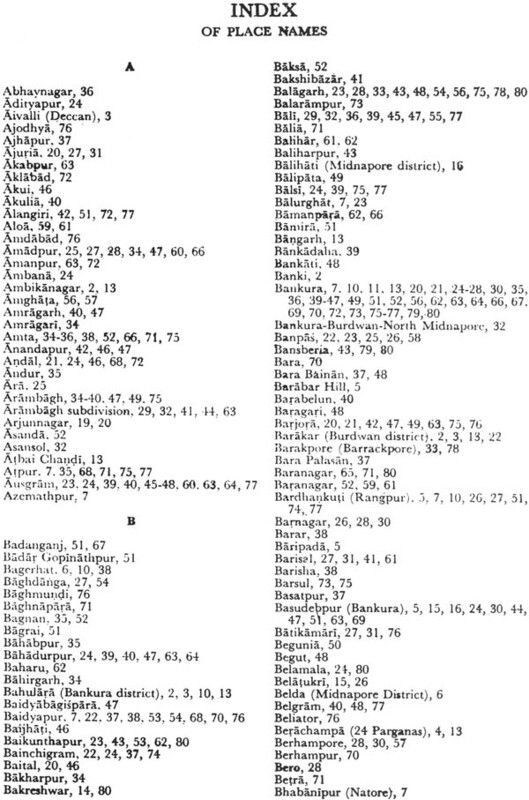 Thanks are due to Sri Adris Chandra Banerji and Dr. Kalyan Kumar Das Gupta who very kindly scrutinised and revised the final proofs out of their love and respect for their late lamented friend and Sri Dipak Sen who saw it through the Press. 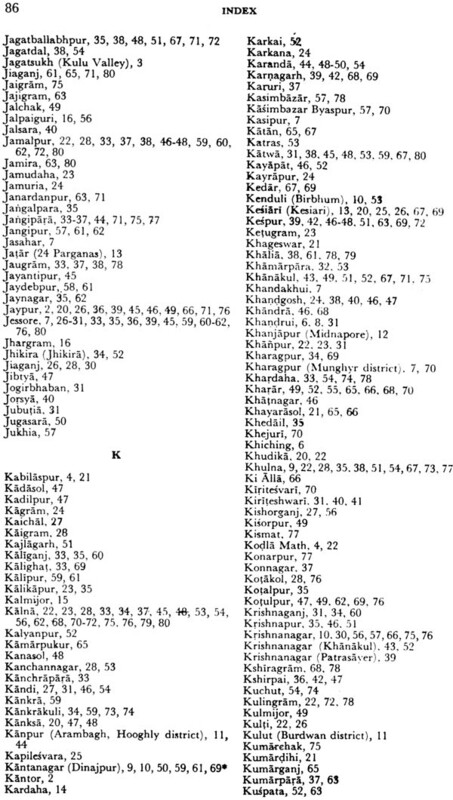 Thanks are also due to Sri Amiya Kumar Banerji, I. A. 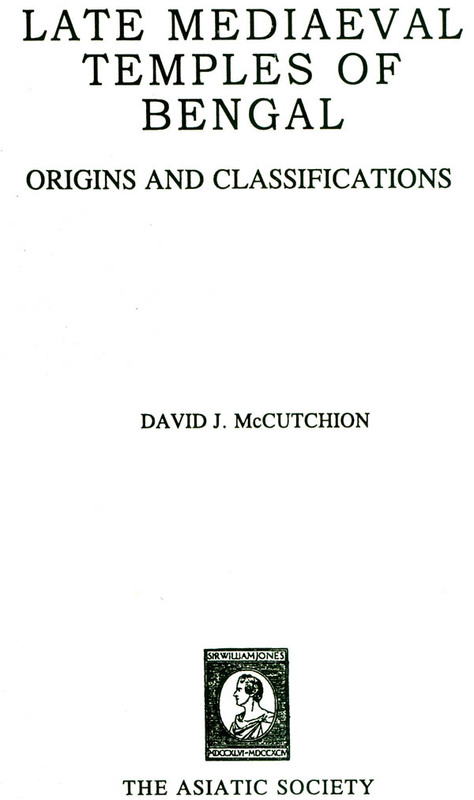 A., a devoted scholar in the same field, though an administrator by profession, for providing us with an estimate of David J. Mccutchion and his works. We regret very much that the author is no more to see his favourite study in print. Born at Coventry in England in 1930. David J. Mccutchion came to India to join the Visva-Bharati University after a short slant as a scholar at Cambridge, where he had been for sometime the Secretary of the Local Tagore Society. Shortly afterwards, he had left Visva-Bharati and joined the Jadavpur University in the Department of Comparative Literature and had died in Calcutta on January, 1972, still in service. After some literary exercise printed under the title-Indian writing in English: Critical essays, he fell into a deep involvement with the Temple architecture of medieval Bengal and had become a virtual martyr to the cause of resuscitating the memory of this great cultural wealth of Bengal, now falling into a state of decay. 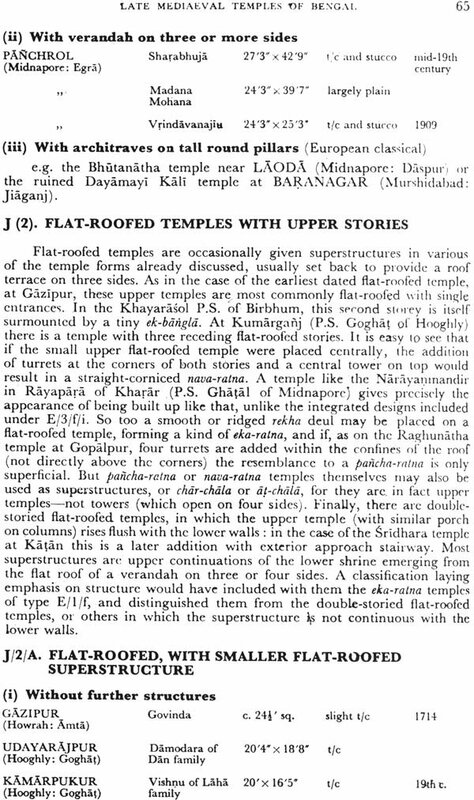 The temples in Bankura were the first to catch his eager imagination, a study on which delivered in lecture in memory of Ramananda Chattopadhyay and later published as a monograph, at once made this foreigner very much known to the circle of elites in Calcutta. 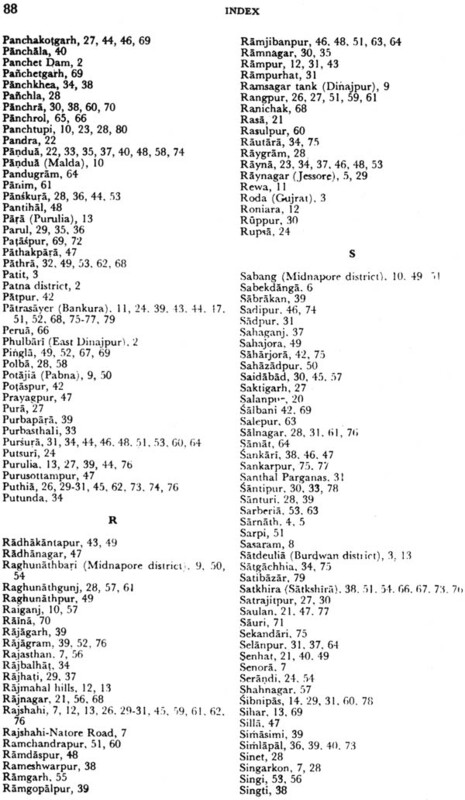 His sphere of acquaintance had however, crossed the perimeter of the elite circle to be soon known and accepted by a large section of unsophisticated village folk of rural Bengal as a person genuinely sharing their life of joy. Love and distress making him intimately one of their own. 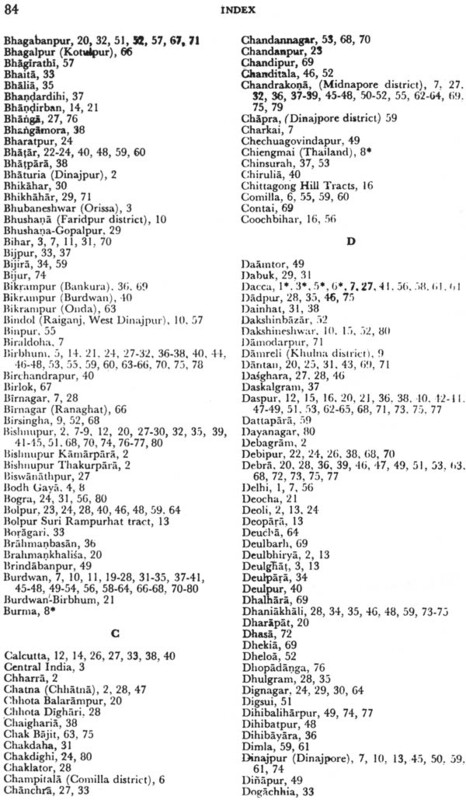 On an invitation from the Asiatic Society, Mccutchion had delivered a lecture before its members on May 20, 1970 and this monograph, which is being issued as a reprint was published by the Society in 1972 as a text of the same lecture. The work offers a very wide critical study of the numerous monumental structures found almost all over the area which had been the undivided Bengal before partition. Being the result of a novel experiment in recapturing the glory of the great temple art of ancient tradition lost to oblivion by devastation, these brick structures of mediaeval age have preserved on record the resurging mood and the structural ingenuity of a people under the state of an unprecedented situation. 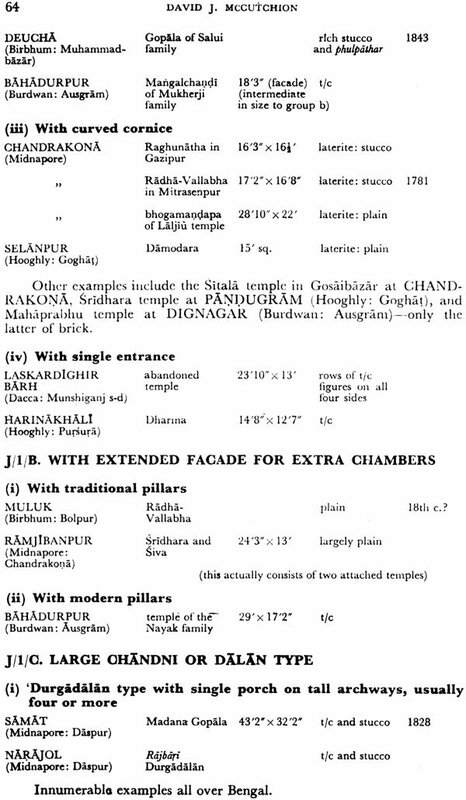 In this monograph can be found a survey of the structural forms of the temples characterised by a variety of novel forms and shapely proportions, denominated by such names as Bangla Mandir of the Do-Chala, Char-Chala and At-Chala varieties or Ratna types as the Pancha-ratna, Nava-ratna and the like. These are further embellished by wall decorations set up in carved terracotta panels showing innumerable designs in the likeness of plants, flowers, animals, birds and linear motifs together with a bewildering array of compositions showing scenes from the Ramayana and the Mahabharata, con temporary social life and an endless assemblage of men, women, birds and animals. 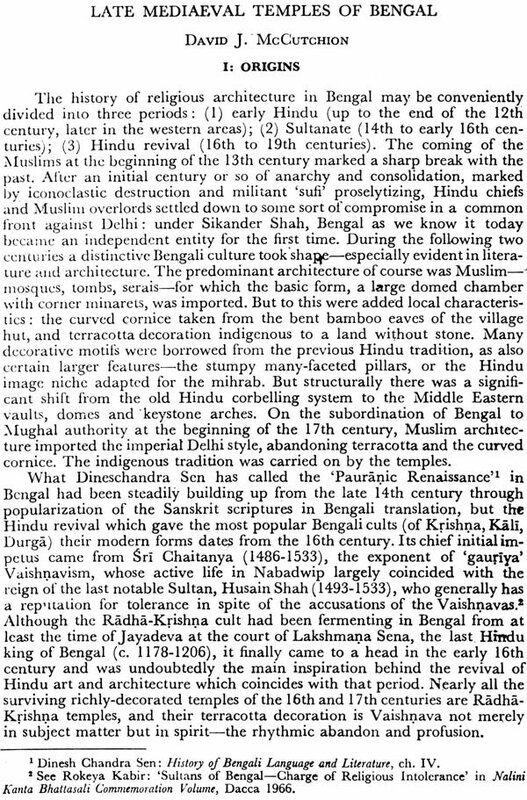 The author has given an extremely sound appraisal of this art of mediaeval Bengal with deep sympathy and understanding. Mccutchion had established a very close brotherly relationship with many among the local people. Though snatched away by the cruel hand of dusting at a quite early age, Bengal will undoubtedly cherish the memory of this foreigner with love and fondness for the deep and sympathetic understanding of this land of his adoption. Having been out of print for quite sometime proving its popularity, the Asiatic Society is issuing the monograph in a reprint, as an humble homage to the departed author. 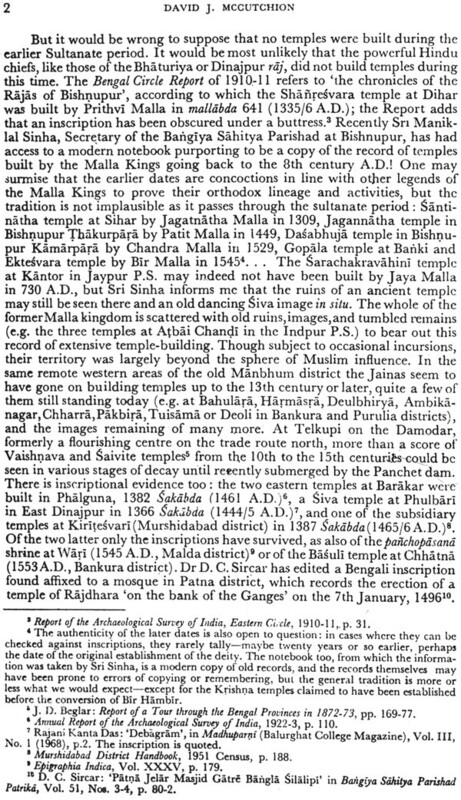 It is a great privilege to present to the discerning readers the reprint edition of 'Late Mediaeval Temples of Bengal' by David Mccutchion. 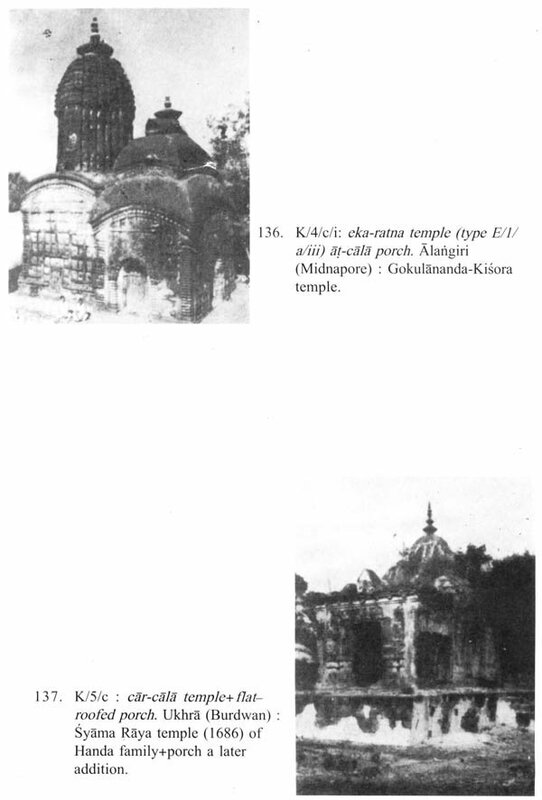 David Mccutchion did a pioneering work in focussing our attention to the temple architecture with particular emphasis on terracotta style and the need for preservation for posterity. 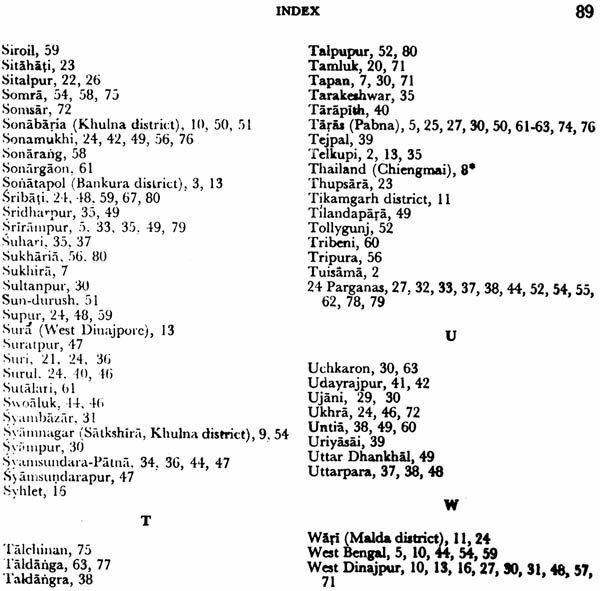 This well documented monograph became not only a great source material for further study in this neglected area but inspired other budding researchers to undertake research based on arduous field work. 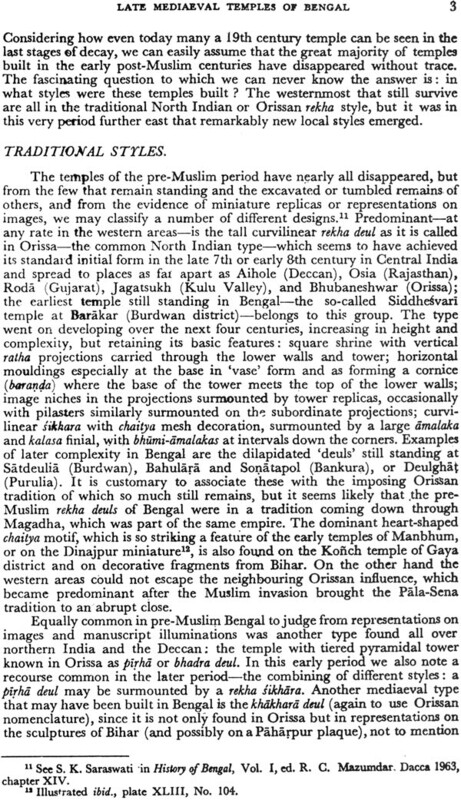 It is hoped that this reprint edition would greatly encourage the endeavour to conserve the late mediaeval temples of Bengal. WRITING on a work of David Mccutchion, a dear friend is, at best, a delicate assignment. To be called upon to do so when the author is no more is heart-breaking indeed. Yet I have volunteered to undertake this difficult task only to be able to bring to public notice the prodigious labour and cheerfully borne sacrifices that have gone into its preparation. I knew them all at first hand from years of close association with the author in the same field of study and am convinced in the belief that in his case sheer over-work cut short a young life so full of promise. The present introductory remarks would, therefore, be more obituary in character than aim at a critical appreciation of the book in the usual doctrinaire tradition. 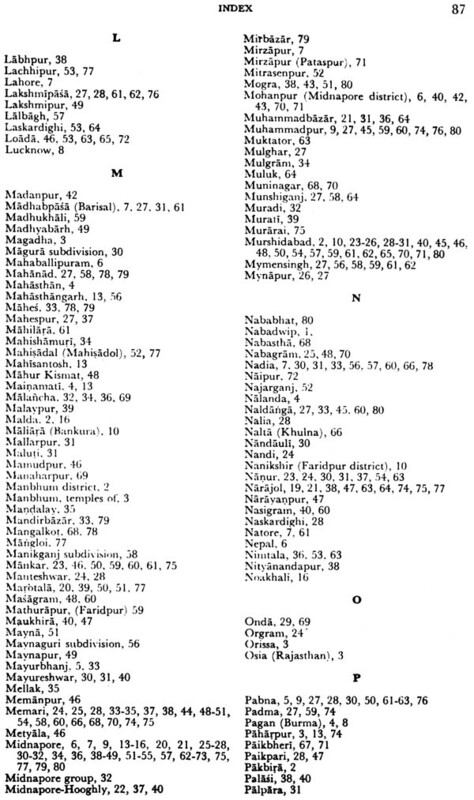 I need not perhaps dwell upon the bio-data of David J. Mccutchion, which are to be found elsewhere in the book. It would suffice for me only to ruminate over his long and arduous intellectual journey culminating in the preparation of the present volume. 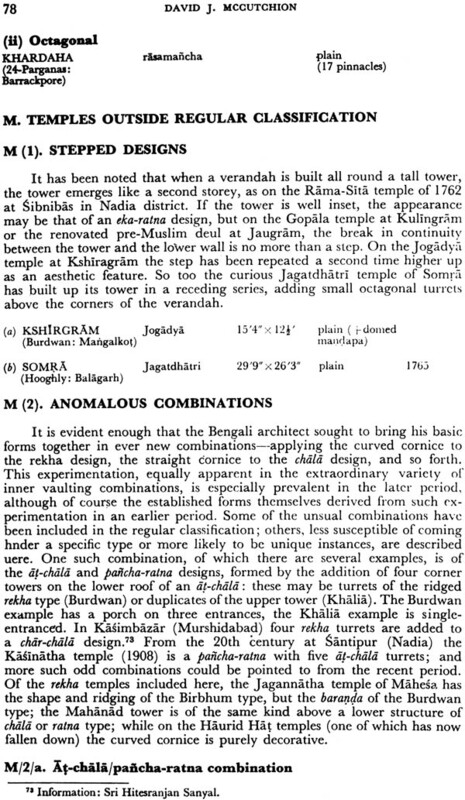 Let me say at the outset that I, for one, do not attach much credence to the various claims made recently that his deep attachment for the historical monuments of both Bengals, and the terracotta temples and mosques in particular, stemmed from sources other than his own interest in the subject. 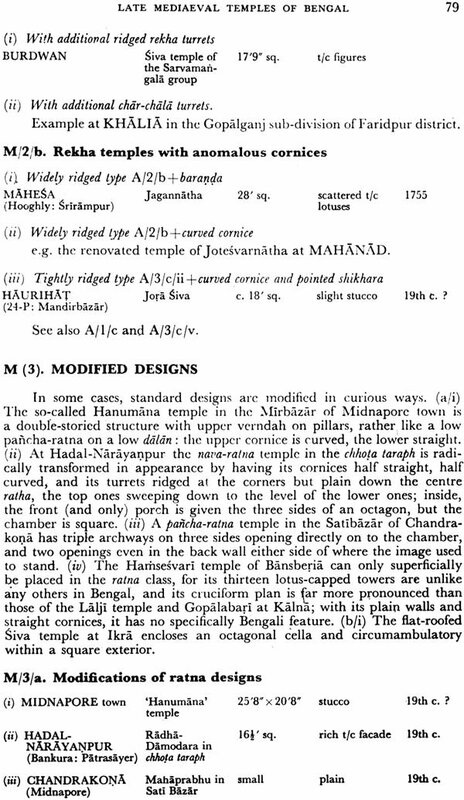 It is difficult for me to believe that while serving as a teacher in Santiniketan, his sharp inquisitive instincts failed to lead him to Sural, a village barely a couple of miles away, which is full of terracotta temples one of which, the Lakshmi-Janardan shrine (mentioned at page 46 of the text) can easily be ranked as one of the finest of its kind in West Bengal. 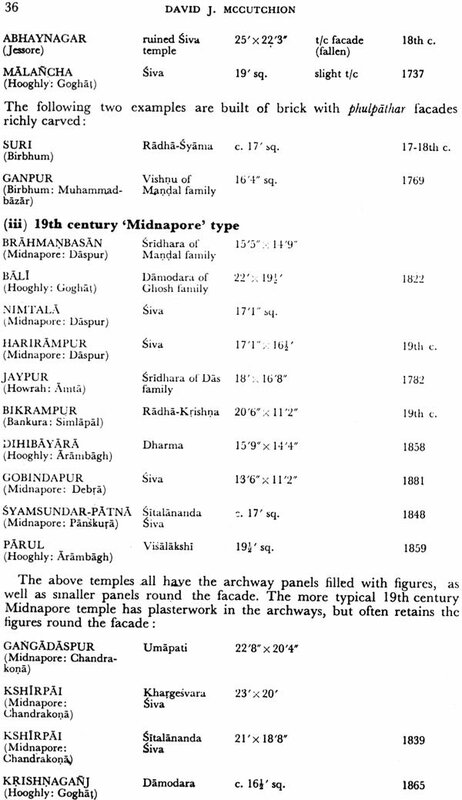 Supur, another nearby hamlet off the easily negotiable asphalt road to Illambazar, boasts of a number of fine terracotta temples while Illambazar, connected with Bolpur by frequent bus services, is a veritable storehouse of such monuments. 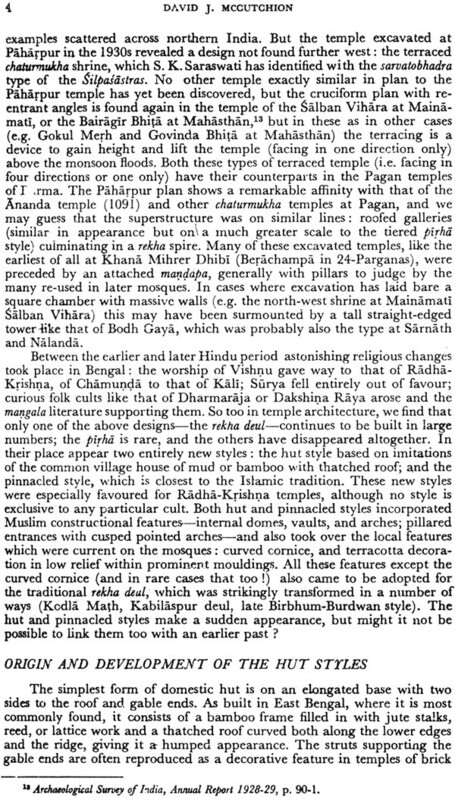 Birbhum is a district very rich in terracotta temples and there are scores of them within a 20-mile radius from Santiniketan. David did not miss seeing many of them although he embarked upon a serious study of this architectural wealth, may be, a few years later. The delicate artistry of the embellishments fashioned from as flimsy a material as common clay produced such an impact on his imagination that, for him, it was love at first sight. Thereafter, for years on end, he blazed a lonely trail across the remote countryside of both Bengals to see and understand the mysteries of his beloved. And the more he saw the more his interest grew. Even a casual reader of the present volume will not fail to notice the stupendous amount of field work that has gone into its making. Indeed, its author is the only scholar so far to make a first-hand and detailed coverage of the innumerable temples of West Bengal as also of Bangladesh, both photographically and otherwise. To him a cursory visit to a temple site only to take a long-distance snapshot or two of the buildings bordered on profanity itself. As a pioneer in an inadequately explored field of study, he knew a heavy responsibility rested on him in making his documentation as thorough as possible. I have seen him spend hours to cut down the overgrowth covering monuments so that he could get clearer pictures, take grave risks to remove reptile-infested shrubbery to have correct measurements or brush off with infinite patience the moss and dirt collected on the terracotta panels so that he could photograph them better. The details of the enormous physical suffering he underwent to reach hundreds of remote temples on rickety cycles or on foot and without food and drink for long spells would never be known for this part of the saga was of least consequence to him. And these cheerfully-borne sacrifices of a foreigner have gone into the making of the present volume which, by virtue of the incredible wealth of information packed into its meager 80 pages, will remain, for long, the most helpful source book on the subject. A scholar so dedicated to our historical monuments and so hopelessly in love with them could not but advocate a strong line for their adequate preservation. He wrote forcefully on the subject in important newspapers and periodicals, persuaded well-known persons to join him in his conservation and periodicals, persuaded well-known persons to join him in his conservation crusade and readily agreed, at my instance, to serve on a Committee set up by the Public Works Department of the State Government to implement his cherished desire. 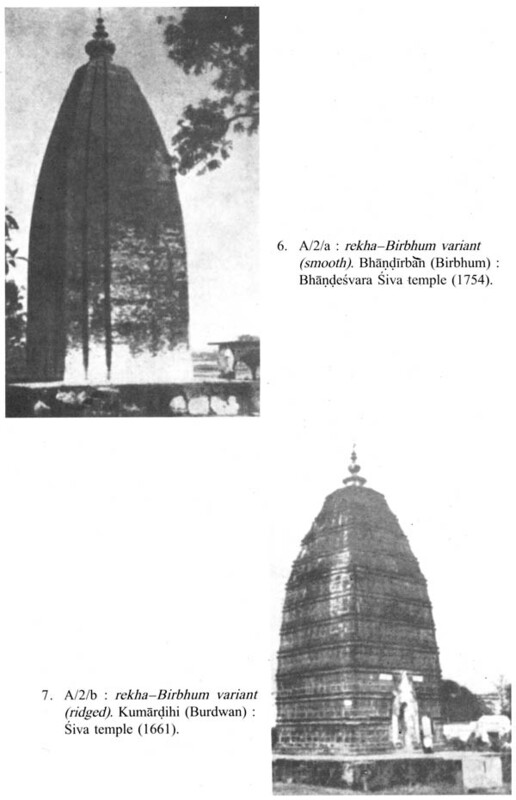 Since none of the members of the Committee shared his wide knowledge about the monuments, he would carry to every meeting score of photographs to convince them of the utmost necessity for immediate scores of photographs to convince them of the utmost necessity for immediate protection of these architectural treasures. But he never pleaded for amateurish repairs effacing their original 'character'. To him unimaginative as dim as the distant horizon in numerous cases, he would carry with him on his tours a small tin of a tree-killing liquid (a commercially produced strong poison) and exhort the villagers to apply it on their overgrown monuments. 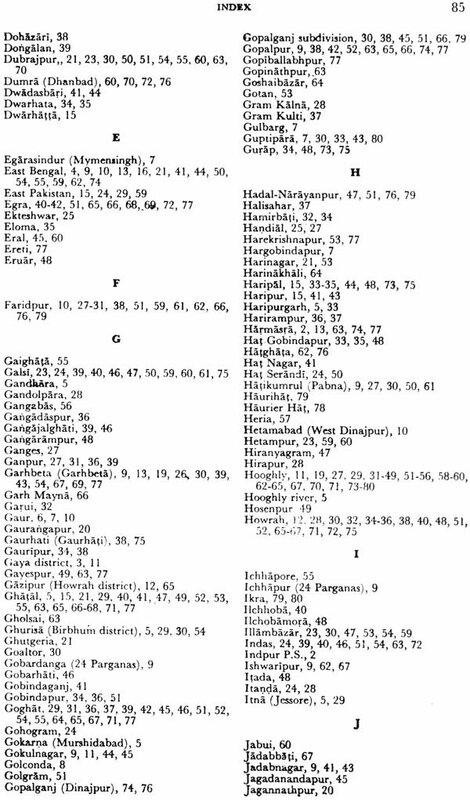 In his faltering Bengali, he would zealously harangue with them to make them understand how to apply the chemical or to procure more, if needed. I can affirm without any fear of contradiction that such a genuine lover of our architectural treasures is yet to be born among the sons of the soil. MY work would have been impossible but for the hospitality, encouragement, help and guidance of innumerable temple owners, teachers, local enthusiasts, villagers of all kinds, and government officers all over West and East Bengal. To them I feel an unforgettable debt of gratitude not only for assisting my research, but for the unstinting friendliness which made that research a pleasure. Of these I must single out for special gratitude two local scholars who have done much to preserve and create understanding of the culture of their home areas; Sri Panchanan Ray, Kabyatirtha, of Basudebpur in the Daspur P. S. of Midnapore, and Sri Maniklal Sinha, Secretary of the Bangiya Sahitya Parishad at eight years, Sri Hitesranjan Sanyal, with whom so many temples were first visited and all information shared; to that indefatigable field-worker, Sri Tarapada Santra, for trudging with me miles across the paddy fields; to my former student Sri Suhridkumar Bhowmik, who showed me all round the Arambagh sub-division by cycle; and to Sri Amiya Kumar Banerji, I.A.S., for taking me with him on a number of his tours by jeep. 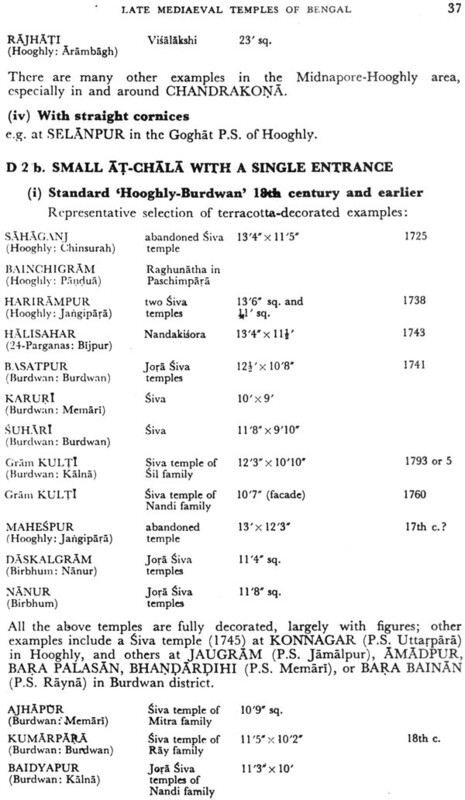 Sri Banerji and Sri Santra have also been able to fill in some of the gaps in my data, by providing the base measurements of a number of temples I visited while my interest was confined to terracotta decoration; these I have indicated by a star. In East Bengal my thanks in particular are due to Dr A. B. M. Habibullah, Head of the Department of Islamic History, Dacca University, for his unfailing encouragement, and to Dr Nazimuddin Ahmed, then Superintendent of Archaeology, East Pakistan Circle, for his assistance in arranging my tours. At the Asiatic Society I must express my gratitude to Sri Adris Banerji for reading through the manuscript and helping with the diacritical marks, to Dr Kalyan Kumar Das Gupta for final corrections in proof-reading, to Sri Dipak Sen, publication Supervisor, for planning the layout during my year's absence in England, and preparing the index of place names and at the Sree Saraswaty Press Ltd. To Sri Amit K. Roy Choudhury for taking special care over the blocks, and to Sri Subodh Kumar Mitra Rai for promising personal supervision of the printing. Finally, I am greatly indebted to Jadavpur University, and especially the Registrar, Sri P. C. V. Mallik, for granting me one year's study leave with pay in 1967-8, which enabled me to make far longer tours, especially in East Bengal, than would otherwise have been possible.